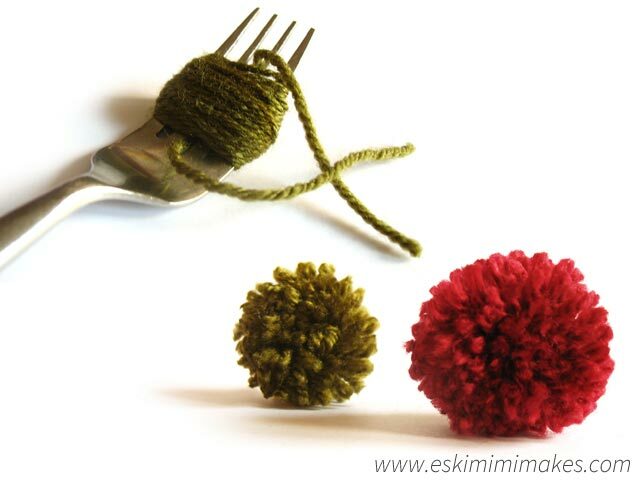 I believe the best way of making small pompoms is using a fork. There are many ways of making nice, full and round looking pompoms (pompons, pom-poms or pom-pons as they are variously written) but the quickest and most wonderful way I know of creating perfectly round and beautifully formed pompoms is to use a humble piece of cutlery. Some yarn (DK weight acrylic yarn is used for the pictures below, but experiment with different yarn weights for different pompom effects. 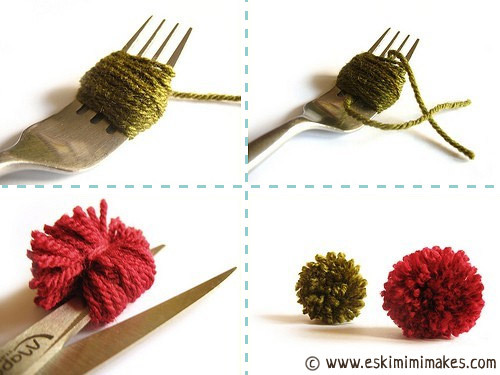 Here, for your yarn-filled enjoyment is a guide on how to use a fork for creating lovely ittle pom-poms. 2. Cut a length of yarn 20cm or so long, and thread beneath your yarn wraps between 2nd and 3rd fork prong. Pass the other end of this length of yarn between prongs over the top of the yarn bundle. Pull both ends and tie into a tight knot. Tie as tightly as you can. 3. Slip yarn bundle off the end of your fork. snip through all the loops of yarn, and roll pompom between palms to ‘fluff’. Trim any uneven ends. TIP: The more times you wrap your yarn the more full and fluffy your pompom will be, but they will also require a little extra attention at the trimming stage to ensure that they are perfectly round. Pooling, Dyeing and Stitch Counts. VERY cute, and a lovely idea for the “finishing touch” my recent FO is lacking!! Never would have believed it, but now I see it I can see that it makes perfect sense. Thanks for posting. Hey thats a great idea. Ive got a salad fork. I might use this idea to make a biggger pom pom , its easier than cuting out circles . Thank you for the inspiration. Absolutely love this idea – found it on Pinterest and think it’s fab! I am so thrilled to find this one! Wow! so easy. Thank you for sharing. This is great – thank you very much for the instructions. knitsamadworld, I looked through Apple Yarns entire Facebook Timelne and every single photo, and there was NOT a photo like Eskimimi’s Fork Pom Poms anywhere on their page. Plagarism is a serious accusation, I believe you owe Mimi an apology. I think you may have misunderstood. Knitsamadworld wasn’t accusing me of plagiarising Apple Yarn’s work, rather that they had stolen my pictures. Knitsamadworld was completely correct, they had, so I contacted them to point out they had broken Facebook’s Terms and conditions and told them to remove my work, which they did. Thanks so much for this tutorial! I’ve been making children’s hats as gifts and wanted to add a pom pom to one, but didn’t want to pay for a pom pom maker. I used a serving fork, wrapped 60 times and it was the perfect size! Very cute and I will Pin this too! I’ve also got this linked to my pom pom tutorials post as well today, nice job! Wow! I must try this. Way better than cutting out cardboard! Hi there! I love this tutorial, so cute! I just had a quick question, I’m finding it tough to have a tight enough knot through the middle to make a fully round pom pom – do you have any tips? Firstly, try tying the centre knot with stranded embroidery cotton/floss instead of yarn/ Yarn always has some stretch to it, making tying tight knots difficult. Secondly, tie a reef knot rather than an overhand knot: this should help keep it secure. Finally, try tying the first part of the reef knot first, as hard as you can, then slipping the pom pom from the fork and then completing the knot, so that the fork isn’t straining the strands of the pom pom apart, and fighting the knot.